This well-recorded performance is a typical Verdi night at the Metropolitan Opera, New York in the mid-1950s. Leonard Warren and Richard Tucker are in the lead male roles. Born in 1911, Warren was a lead baritone in the Italian repertoire at the Met throughout his career. This lasted from his debut in the house in 1939 until his tragic death from a heart attack on the theatre’s stage whilst singing Don Carlos di Vargas in Verdi’s La Forza del Destino. That was on 4 March 1960 at the young age of 49. He had a large voice of wide range and warmth. Between his debut in the role of Rigoletto in 1943 and his death, Warren sang the role no fewer than 89 times at the Met. An early live performance from the house in 1943 has him alongside Bidu Sayao and Jussi Björling (Naxos.110051-52). His interpretation can also be heard in Toscanini’s live recording extracts. An RCA studio recording from 1950 features him alongside Erna Berger as Gilda and Jan Peerce as the Duke with the support of the Robert Shaw Chorale and RCA Victor Orchestra conducted by Cellini (Naxos 8.110148-49). 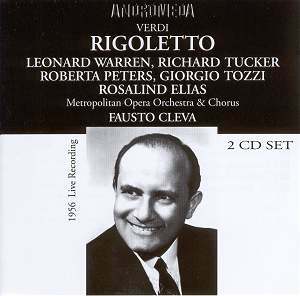 However, when RCA went to Rome to set down their first recording for LP in 1956 they cast the younger and lighter voiced Robert Merrill as Rigoletto alongside Roberta Peters, the Gilda here, and Jussi Björling. It was a recording that did not compete in the UK with that from Cetra featuring Giuseppe Taddei as the jester, Ferruccio Tagliavini as the Duke and Lina Pagliughi as Gilda (see review) or the recording with Tito Gobbi and Maria Callas from the British Columbia label. When RCA went to Rome again to record their first stereo version under Solti in 1961 the great baritone was dead and Merrill featured again (see review). This live recording catches Leonard Warren in good voice and showing just why the Met chose to neglect his renowned Italian rivals when casting the eponymous role. Particular vocal highlights of his interpretation are his reflective Pari siamo as Rigoletto compares his profession with that of the hired assassin he had just encountered (CD 1 tr. 6) and his tenderness in the following act one duet with Gilda (trs. 7-8). His expressive singing of the duet in act two following Gilda’s emergence, violated, from the Duke’s apartments is first class (CD 2 trs.5-7) as also is his pleading and berating of the courtiers who put his daughter in this position (tr. 4). As in the drama of the last act, the conducting of the often-underrated Fausto Cleva is vivid and keeps the drama moving forward whilst supporting the singers. Needless to say the Met chorus is fully on board and the minor roles are well taken. I am more equivocal about the Gilda of Roberta Peters and do not find her voice to be particularly suitable for the role and her singing rather lacks expression and tonal variety. Suitability is also an issue with Richard Tucker’s Duke. Tucker (1913-1975), like Warren was a long standing stalwart of the Met company singing over 600 performances of some thirty roles in the House. A devout Jew and former cantor, he realised his ambition of singing Eleazer in La Juive in New Orleans two years before his death. He was best suited to the heavier Italian spinto repertoire than the lyric and his Duke, although strongly sung lacks the ideal lightness and flexibility of tone of his more lyrical colleagues. This is particularly evident with some lack of brio and élan in Questa o quella (CD 1 tr. 2) and the famous La donna e mobile (CD 2 tr. 8). The simple accompanying leaflet comprises a cast list and track-listing with times. A warning is given of small distortion on CD 1 tr. 8 and CD 2 tr. 3. These are small indeed and did not detract from my enjoyment of this performance, one that, despite some reservations, I would be very happy to sit through on any evening I had spare for attending the theatre.